Primary event day is Saturday, Nov. 17th. Early arrivals the afternoon of Nov. 16th will have opportunity for advance check-in and chrono to begin play earlier on the 17th and potentially engage in evening shenanigans on Friday night. We will need to be off the field with sites cleaned up by 10am Sunday, Nov. 18th. 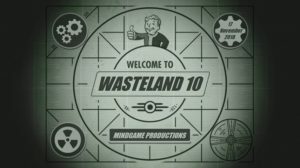 We continue MGP’s Wasteland event series in this alternate reality event inspired by the FallOut computer games. The FallOut world is an alternate reality that diverged from ours at some point after World War II. Technology took a track which developed the “World of Tomorrow” as imagined in the Golden Age of Science Fiction. Before the Great War of 2077, the FallOut world was similar to what the people of the 1940s thought things would be like in the late 21st Century- with domestic robots, atom-powered cars and other wonders of Atomic Age technology. Our game continues in the central Florida Wasteland of 2288. A year ago, surviving members of an Enclave task force established a Florida base of operations in Crystal Springs, enlisting the aid of the Shadow Company Remnants. The cataclysmic battle with the Brotherhood of Steel attempting to eradicate the Enclave presence left Crystal Springs a shambles. Between a giant, rebuilt pre-war robot flinging mini-nukes around the city during the Brotherhood assault, and Enclave Fat Man launchers firing mini-nukes back at the robot… the rising settlement was decimated. Countless citizens were killed, sections of the town destroyed, merchants fled, elections disrupted with candidates killed or driven into hiding. Wasteland legend Rick Coleman was horribly wounded, his body never recovered and presumed dead. Stunned survivors crawled from hiding and looked over the ruins of what had been a bustling town in horror. Even in the Wasteland, nature abhors a vacuum. The survivors began to rebuild. Some returned while new ones arrived. With local survivors pretty much vilifying all the military orders and the destruction they wrought, a wilder, more chaotic settlement arose from the ashes. The residents of Crystal Springs look out for one another, with dozens of weapons ready to pop up and cut down any who disturb the peace without good cause. From out of the Wastes, a warlord set up within Crystal Springs… the Red Duke. His law, brutal as it often may be, helped provide stability to the settlement. An advance element of Rangers from the New California Republic arrived this summer to set up a treaty and trade routes with east coast settlements. News travels slow across the wastes, and they did not find the up and coming Crystal Springs they were expecting. The NCR set up an “embassy” and established a temporary accord with the Red Duke, while the Rangers sized up the situation. Seeing the control the Duke has been securing over Crystal Springs, and after watching his forces sack the Black Marsh stronghold, the NCR believes the Duke is securing his position as warlord. Cost for advance, online registration is $35. Onsite registration is $40. Take advantage of advance registration. It saves you money and makes the organizers’ job easier! Please pay attention to uniform guidelines, weapon and ammo rules! Players should be 16 years of age or older by November 17, 2018 unless cleared in advance.